Dangers: contact may cause skin rash in a small number of people. Mature hoestend, pulled up from the ground. Close-up of young, top, lesser-toothed leaves. Close-up of lower, mature, toothed leaves. 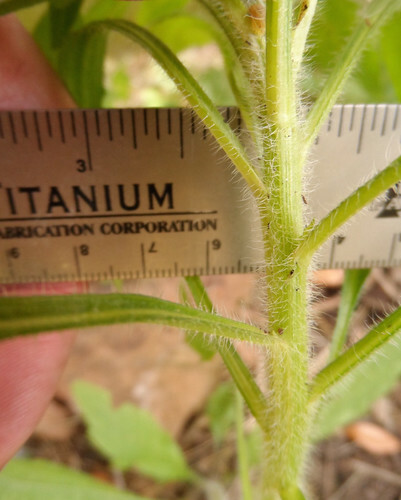 Close-up of young, hairy stem. 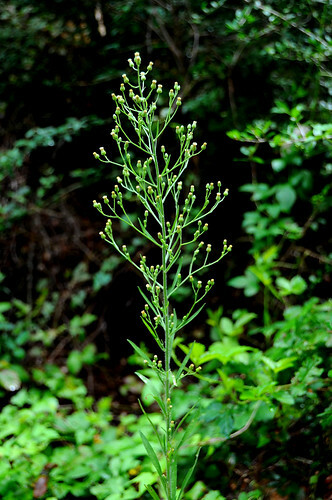 Close-up of top but soon to be lower leaves. 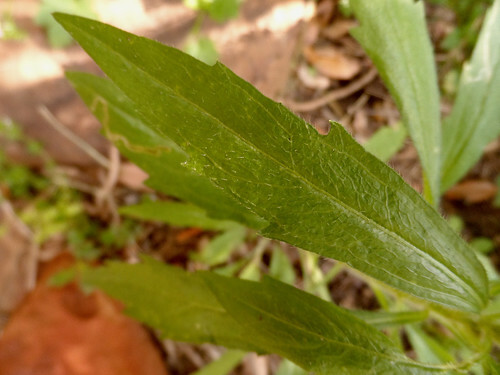 Very close-up of lower horseweed leaf. 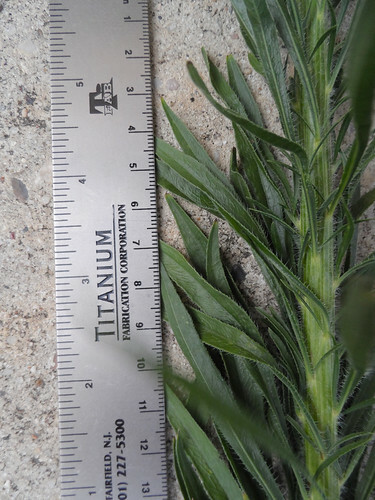 Close-up of horseweed flower buds. 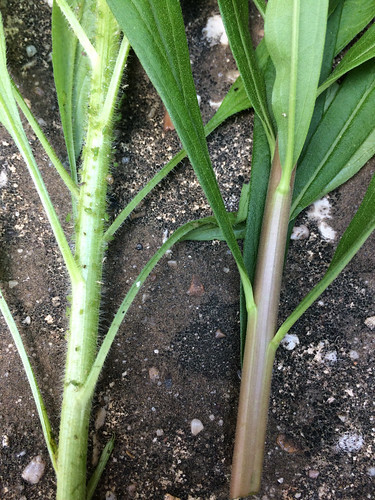 Horseweed on the left, Goldenrod on the right. 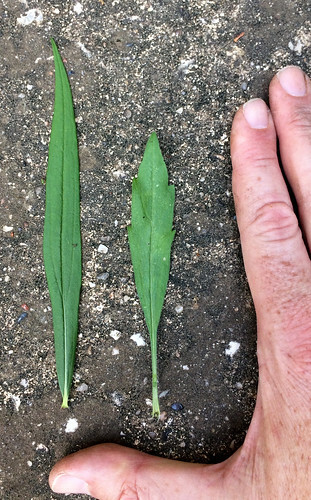 Goldenrod leaf on the left, Horseweed leaf on the right. 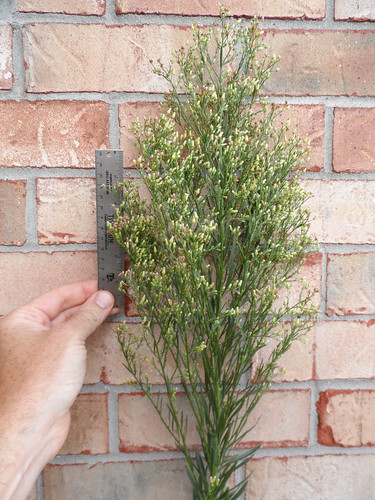 Commonly found near the similar-looking goldenrod, horseweed is another plentiful, delicious weed. It prefers sunny, non-acidic soil that has already suffered being disturbed by mankind. 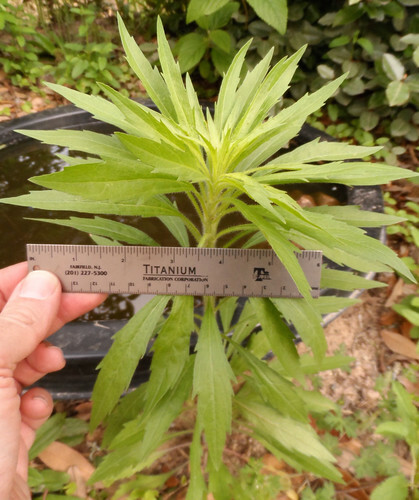 Horseweed usually appears in late spring after goldenrod but comes to flowering maturity earlier, usually in later summer. 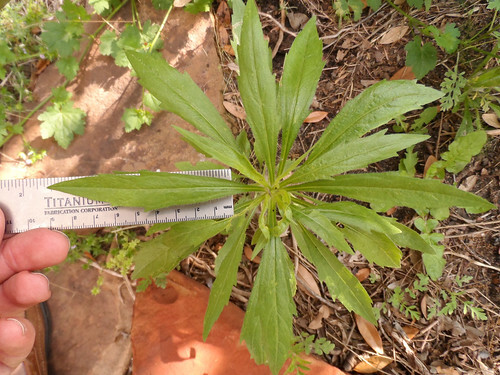 The plant itself is tall, thin, with lance-shaped leaves. Horsehide leaves are found opposite one another with each set alternating 90 degrees from the previous two leaves. 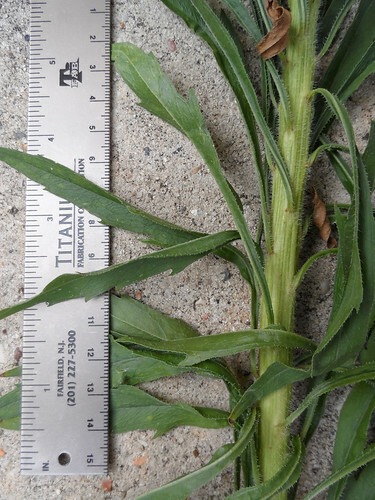 Leaves start out fairly lanceolate in shape but become more toothed as they mature. 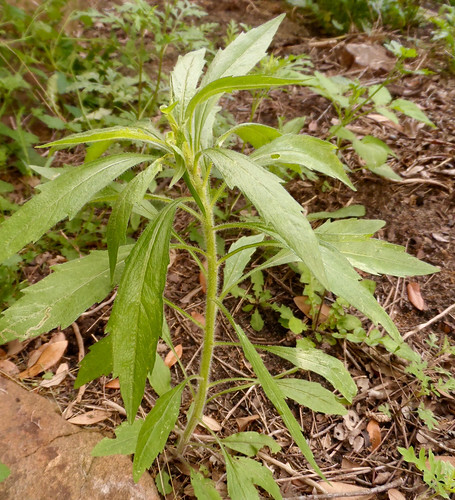 The stem and leaves are both hairy, differing them from the smooth, hairless goldenrod. 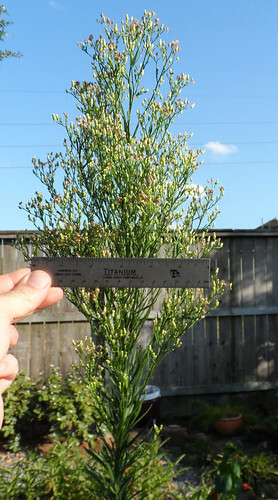 The plant produces hundreds of tiny, white, dandelion-like flowers which splay out less than those of the bright yellow, pyramids of goldenrod flowers. 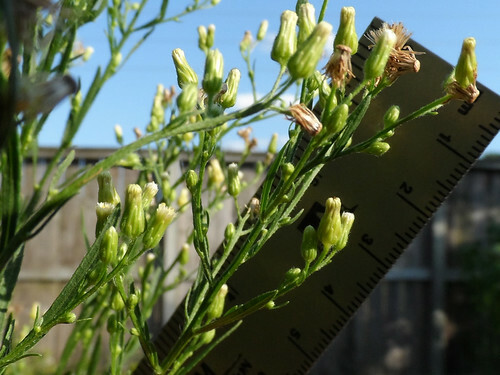 Taste and flavor-wise, horseweed is worlds apart from goldenrod. The young, tender seedlings are boiled by some as a somewhat spinach-flavored potherb. As it matures the flavor becomes more herb-like, reminding me of oregano-basil mix. At this stage I really like using its leaves to flavor venison roasts as they slow-cook in a crockpot all day. Really, what better seasoning for wild meat than wild herbs?! Use a sharp pruning shears to snip off the last 3-4 sets of leaves for use as seasoning. While they can be dried by hanging in your house for later use, the slow-cooking process excels at releasing its flavor even from green, fresh leaves. 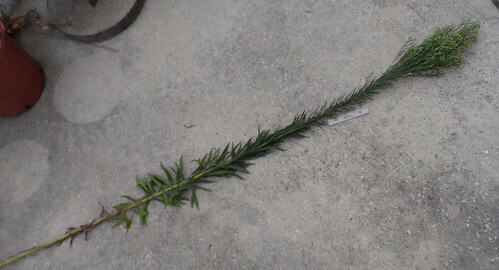 This plant will continue to grow after this pruning, sometimes putting up multiple new shoots from the point of the cut. 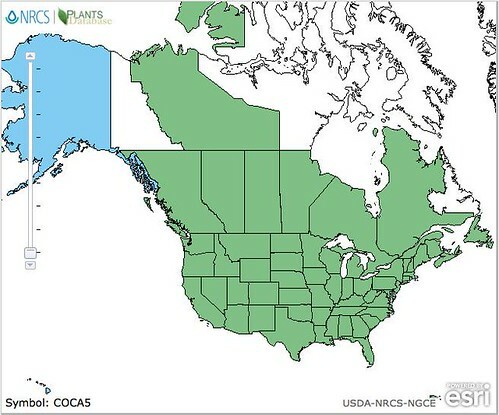 You'll often be able to get 2-3 harvests from a single plant over the course of the spring/summer. Tea made from the leaves has long been used to treat diarrhea and dysentery. Once the flowers appear in July/August/September its use as food has come to an end. 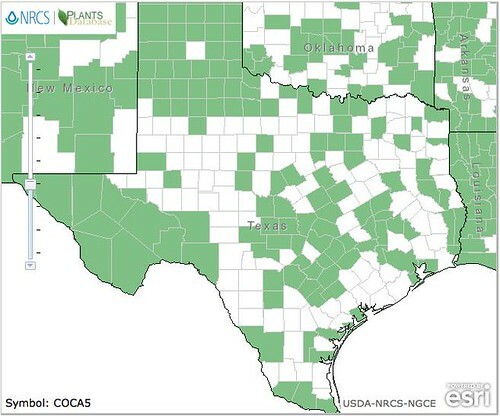 A single plant will produce thousands of drifting seeds, many of which will produce new plants the following spring.